Vata dosha among the dosha types is generally referred to as a dynamic force in the realm of physiology. In case the dosha is dominant in a person, then it can considerably affect the appetite and the digestion process. Typically, the appetite and the capability of digesting food may be observed to be erratic. However, people with Vata Kapha prakriti may put on weight and feel hungry quite frequently. The dosha type is a deviation from ‘vikriti’ which means something way different from what happens naturally. As fat gets accumulated within the body, the craving for food increases. Over a period of time, the weight increases owing to a decrease in the metabolic activity. 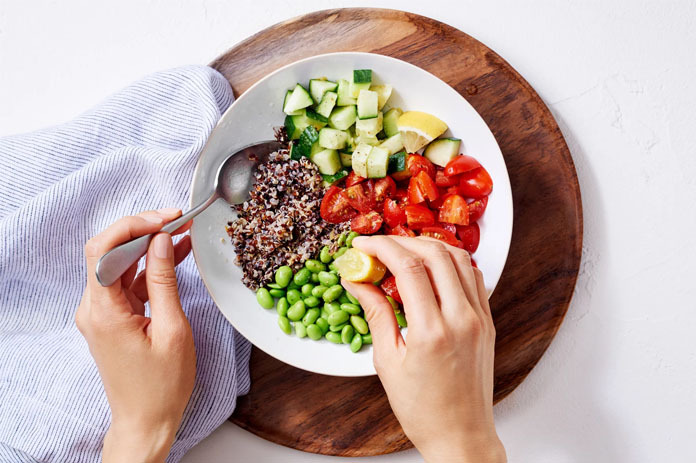 So, as you consider the nature of the Vata Kapha digestion, it’s necessary to know the food items that have to be included in the diet. A person may argue that the dosha is bound to affect the physiological and psychological aspects. But, if the food is not digested properly, then the body won’t function in a better way. 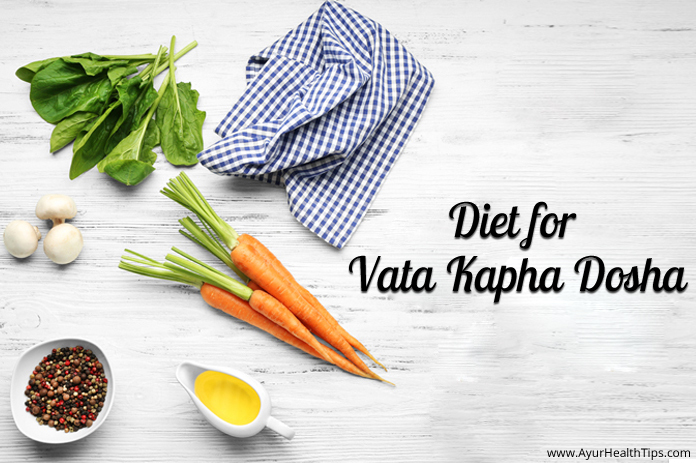 Therefore, while you are planning to follow a Vata Kapha diet, you need to pacify Vata and Kapha. It’s just similar to a mother who is nurturing two kids with different food choices. The best way to maintain a balance is to relish two different kinds of recipes in a meal. You must actually know what is good for your health and for both the doshas. Practically, you can classify the foodstuffs depending on the taste or ‘Rasa’. In Sanskrit, among the six tastes, the salty, sour and sweet tastes always keep Vata under control but aggravate Kapha. On the other hand, it’s opposite with the pungent, bitter and astringent taste. So, if you have Kapha Vata prakriti, then you should be careful with what you enjoy eating. It’s always better to apply a principle for neutralizing the properties without any fear. While this applicable to the doshas mentioned above, this is not the case with other doshas except tridoshic prakriti. As far as the selection is concerned, the foodstuffs should be chosen after following certain rules and those which would produce heat. Rule 1: Always prefer eating cooked food items rather than the ones kept in the refrigerator. In case the food is cold, then you can place it inside a microwave oven and heat it for some time. As you start off with the meal, make sure you don’t eat everything in one go. Instead of filling your stomach all at once, see to it that you eat small quantities at regular intervals. Rule 2: Never eat just for the sake of spending your time. Rather, it’s better to eat food only when you feel hungry or when the meal has already been digested. Rule 3: You should always be at peace and be conscious of what you are eating. Moving ahead, you should avoid nibbling on food items while you are roaming around or speaking with someone. This can eventually lead to gas, a heavy stomach and indigestion. Rule 4: If you want to drink something, then think about taking it one hour before or after having the meal. Depending on what your body requires, you can sip the juice slowly or drink small glasses of water at regular intervals. Rule 5: Remember to keep the breakfast and dinner light. Consider having a heavy lunch in the afternoon and think about having dinner around 8 pm. Rule 6: Decide on what you need to eat even when you are going to consume cooked food. Insist the person to add spices like coriander, ginger or garlic just to enhance the taste. You may also chew three / four teaspoons of fennel seeds soon after the meal. Rule 7: Oils like olive oil, mustard oil, and sesame oil can be good for your health. But, make sure you just take four to six teaspoons every day. Rule 8: Avoid having Soy milk as this can aggravate Vata. Instead, you can have coconut milk or skimmed milk and enjoy probiotic yogurt mixed with honey. During the summer season, you can take a cup of buttermilk. But, when the cold season sets in, you can very well take yogurt. Rule 8: Cereal based dishes should always be eaten instead of refined flour based dishes. In case Kapha becomes dominant, then try eating millets with little ghee or barley. Rule 9: If you feel like eating meat, then you can relish chicken and turkey. On the contrary, excess seafood can aggravate Kapha. But, egg white can be eaten twice during the entire week. You can also eat protein-rich food items like lentils and moong beans. Moreover, if you are vegetarian, then you would be able to maintain your health for a long term. Rule 10: While it’s good to have fruits because they aren’t too sweet, a moderate intake of fried nuts can certainly add on the health. Rule 11: Finally, you should not drink excess tea, coffee or alcohol throughout the day. In case you are following a diet as per the doshas, then you should avoid sour or pungent foodstuffs since they can aggravate Pitta. As you wake up in the morning, you should always drink a glass of lukewarm water. This can be later followed with the consumption of 8 almonds and 10 raisins. After some time, you can relish a cup of herbal or green tea. In order to add on to the taste, you can a little bit of sugar or maple syrup. When it’s breakfast time, you could eat a platter of fruits along with cereals mixed with milk. Try to keep breakfast simple and never skip it as it can aggravate Vata. After the breakfast, you could wait for a few minutes and have herbal tea. For lunch, you could have cereal based recipes and white meat or lentils cooked in low-fat oil. To combat the Vata aggravating effects, you need to add a few spices to cooked lentils and beans. At night, you should keep the dinner light and include chicken bone soup. If you season the soup with ginger and pepper, then meal would be able to alleviate Kapha and certainly be beneficial for Vata aggravation conditions. In case you are thinking about alternatives for food items that aren’t available in the market, then you could consider eating basmati rice, whole wheat or wild rice. Instead of white meat, the best option is to eat chicken or turkey. Depending on the availability, you can enjoy eating fruits like peaches, cherries, apricots, and papaya. If you plan to consume dairy products, then it’s recommended to eat cottage cheese or goat cheese in small amounts. During the summer season, you can have green tea or sour fruit juices like lemon juice, pineapple, and pomegranate juice. If you are concerned about nuts and seeds, then either roast in a low flame or sprinkle some salt. Nut butter should always be consumed in limited quantity as it can have an effect on the secondary Kapha dosha. As an alternative, you can think about eating walnuts, sunflower seeds, and pine nuts. When it comes to eating legumes, you should prefer eating Moong beans and pink colored lentils. In order to improve the digestion process, you can soak legumes before cooking. It also becomes easier to digest legumes when they are cooked and seasoned with spices. As you prepare recipes, you should set a limit while adding kidney beans, soybeans, navy beans, peas, lima beans, fava beans or chickpeas. Do make a note that you should never cook food in Flaxseed oil. All kinds of spices are good for the health only if they are used judiciously.